A healthy diet is important throughout your entire life. But when you are a child, it is especially important. And while nobody can say they eat the perfect diet, those who eat well tend to eat sugary sweets in moderation. A diet based on nutrient-rich foods will help your child feel energized, put them in a better mood and promotes physical and mental health. According to the American Psychological Association, starting a healthy diet during childhood has long-term advantages. For instance, eating healthy in the formative years makes it much more likely that these children will continue their good eating habits throughout life. Getting children to eat healthy is a tricky road to travel, but the benefits are undeniable. River Valley Pediatrics, home of your New Braunfels pediatrician, offers the benefits of a healthy diet. Children who maintain a healthy diet receive direct brain development benefits. For example, a child who doesn’t get the recommended amount of iron and iodine may experience cognitive and motor development delays. Children who don’t receive enough of the fatty acid DHA may experience delays in development and learning. A healthy diet is important to support continued growth and physical development. Food that contains complex carbohydrates, minerals, vitamins and protein are necessary for your child’s growth and development. Experts recommend that children get at least five servings of fruits and vegetables per day. 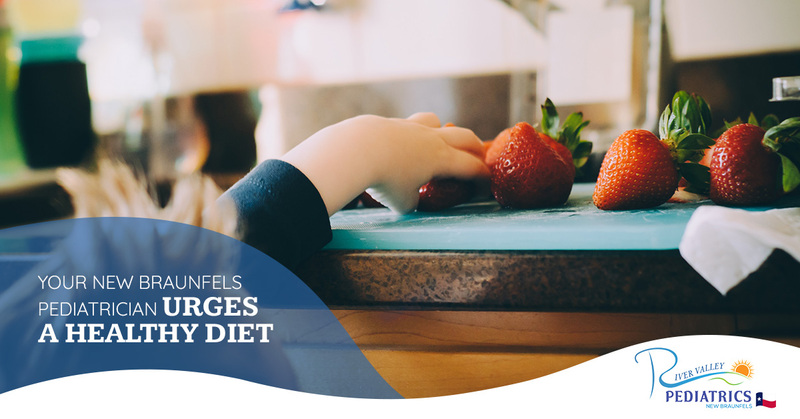 Ideal body weight will vary from child to child, but by eating a healthy diet, it makes it much easier for your child to stay within the recommended weight range. Published data show that children’s diets change dramatically through the preschool years, with a notable spike in sugar intake. Eating too many sugary foods and low-nutrient processed foods are strongly linked with obesity, which tends to develop in mid-childhood. It is not a good idea to focus on the weight of your children as this can lead to a poor body image. Rather, you should put an emphasis on promoting healthy eating habits. In cultivating healthy eating habits, children learn to make better food choices. With a strong immune system, children suffer fewer colds and flu bugs. Researchers have linked high fruit and vegetable intake with a reduced risk of several medical conditions including eczema and rhinoconjunctivitis. The consequences of a poor diet are bad. A poor diet can lead to adult obesity, which affects 30 percent of the population. A poor diet can lead to type 2 diabetes, which kills an estimated 1.5 million people each year. A poor diet is even linked to an increased risk of cancer. Pretty scary stuff to be sure. A diet with adequate magnesium and calcium is critical for strong bones and teeth. Maintaining healthy bones is vital in preventing osteoarthritis and osteoporosis later in life. A diet filled with cabbage, cauliflower, robocall, legumes and milk will help your children get the calcium they need to maintain healthy and strong bones and teeth. Green leafy vegetables, nuts, seeds and whole grains are a great way to ensure your kids get the magnesium they need. Research shows that a diet with a high glycemic load can cause increased symptoms of fatigue and depression. Children who eat refined carbohydrates, like those found in white bread, soft drinks and cake, are at risk for these symptoms. A diet of fruits, vegetables and whole grains reduce your glycemic load. A healthy diet just might improve overall mood. Your colon is full of naturally occurring bacteria and it plays an important role in digestion and metabolism. Certain strains of bacteria also produce vitamins B and K, which benefit the colon. There are also strains of bacteria that fight viruses and harmful bacteria. A diet high in fiber helps good bacteria thrive in the gut. A diet low in fiber and high in sugar and fat alters the gut microbiome and increases inflammation. Fiber is available in grains, legumes, fruits and vegetables. With all of the benefits of a healthy diet, it is quite clear that people who maintain a healthy diet throughout life live longer. Contact River Valley Pediatrics if you have questions about your children eating a healthy diet.